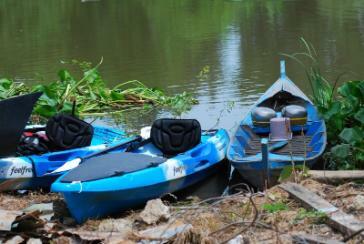 This kayak tour consists of three tracks along the Lopburi River, a loop in the Choa Phraya River. 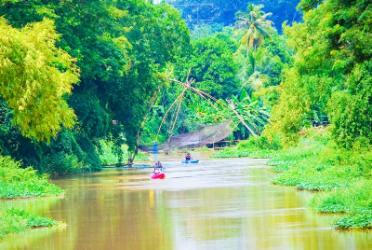 The Lopburi River is one of the three tributaries of the Chao Phraya River in central Thailand. 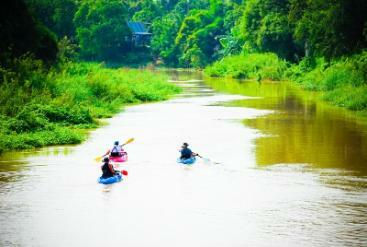 It splits from the Chao Phraya River in Bang Phutsa district in Singburi Province. The river flows through the Singburi, Lopburi and Ayutthaya provinces and enters the Pa Sak River at Wat Tong Pu in Ayutthaya. 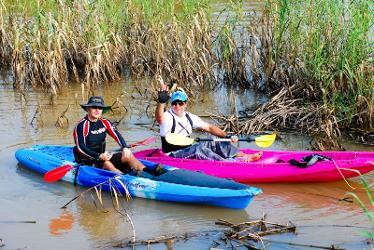 The river is 96 Km long of which 62 Km flows through Ayutthaya Province. King Narai (r. 1656-1688) used the Lopburi River for his boat travels between the Grand Palace in Ayutthaya and the palace in Lopburi. The king boarded at the Wasukri landing in front of the Grand Palace in Ayutthaya, turned into Khlong Sra Bua, to join the Lopburi in the north. The trip took him 2 days with an overnight in Chao Pluk in the location of Wat Na Wua. He disembarked at the old royal harbor at the back of the Lopburi palace and entered the Lady's Court through the western gate "Yatra Kasattri" after climbing a flight of stairs, called "the fifty-one steps".